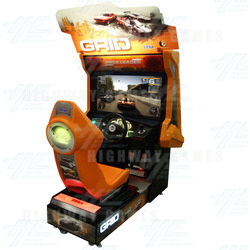 UK-based developer Codemasters has signed an agreement with Sega Amusements Europe to bring its acclaimed "Grid" racing game to the arcades. Previously released on home consoles, the arcade version features a 32" HD screen, force feedback steering, and links up to 6 players together. There are three different modes: Championship, Multiplayer and Quick Race. The three tiered Championship mode features world famous circuits and street tracks from around the globe. You need to come first, second or third to go to the next tier, and if you come first, you will unlock a special event in the following tier. In multiplayer mode, players go head to head racing in some of the world's most desirable supercars. Manufacturers featured in the game include Aston Martin, Bugati, Dodge, Ford, Koenigsegg, Jaguar, McLaren, Mercedes, Pagani, Saleen and Toyota. Tracks include Donington Park, Detroit, Long Beach, Milan, Nurburgring, Okutama, San Francisco, Spa Francorchamps, and Washington. There are three different modes: Championship, Multiplayer and Quick Race. The three tiered Championship mode features world famous circuits and street tracks from around the globe. You need to come first, second or third to go to the next tier, and if you come first, you will unlock a special event in the following tier. In multiplayer mode, players go head to head racing in some of the world's most desirable supercars. Manufacturers featured in the game include Aston Martin, Bugati, Dodge, Ford, Koenigsegg, Jaguar, McLaren, Mercedes, Pagani, Saleen and Toyota. Tracks include Donington Park, Detroit, Long Beach, Milan, Nurburgring, Okutama, San Francisco, Spa Francorchamps, and Washington.